Reference number for this case: 10-dec-54-Evaux. Thank you for including this reference number in any correspondence with me regarding this case. Ufologist Raymond Veillith noted in the 1960's statements of one Mr. Sauthon in Evaux les Bains, in the Creuse, saying that in "the night of Friday 10 to Saturday 11 same phenomenon (as the one he reported for the previous day); no perceptible noise; light appearing specific to the object, at a certain time a small cloud passed in front of it, but for a short duration, for it reappeared at once. Relatively clear sky, slightly cold temperature." 1°) "In the night of Thursday 9 to Friday 10, December 1954, at about 10:45 P.M., while going outside in the Hotel's yard, I was first struck by a fast gleam passing in the sky and coming from the North-East and going towards the South-West. Immediately after this, a luminous ball of approximately 10 centimeters diameter resembling a large star with changing color, changing from an opaque white to a flaming red, was hovering in the sky for some 20 minutes; the latter being at an angle of 90°, and moving rather slowly towards the West. With an impression of getting closer to the ground - I repeat getting closer to the ground - for logically this phenomenon if disappearing in the distance should have decreased its surface; which was not the case. Cloudy sky [illegible] without any star, clearing at about 11:45 P.M."
2°) "In the night of Friday 10 to Saturday 11 same phenomenon; no perceptible noise; light appearing specific to the object, at a certain time a small cloud passed in front of it, but for a short duration, for it reappeared at once. Relatively clear sky, slightly cold temperature." 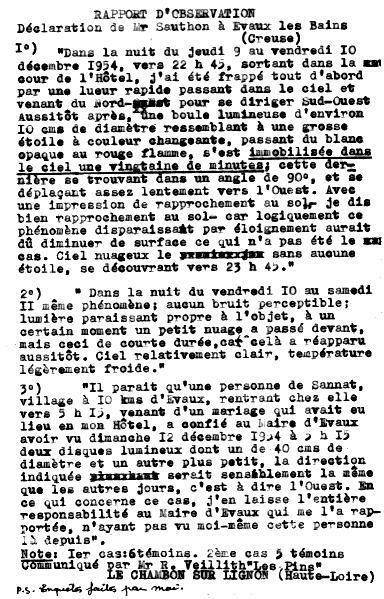 3°) "It appears that a person of Sannat, a village 10 kms of Evaux, returning to her home at about 05:15, coming from a wedding which had taken place in my Hotel, entrusted to the Mayor of Evaux that she saw on Sunday, December 12, 1954 at 05:15 two luminous discs one of which was of 40 centimeters and another smaller, the direction indicated would be appreciably the same one as the other days, i.e. the West. With regard to this case, I leave its whole responsibility to the Mayor for Evaux which reported it to me, not having seen this person myself there since." Communicated by Mr. R. Veillith "Les Pins"
The website indicates that on 10 December 1954 at 22:45 in "Evaux.Bains", France, "Hovered." And: "A hovering object was observed. One object was observed by several witnesses." Raymond Veillith was the founder of the journal UFO Lights In The night France. The document that I give here, of which I have the original, followed a path that says something about the difficulty of preserving ufologists' files. In the 2000s, there was a discussion on an English Ufology mailing list, "UFOupdates", about a case in Latin America. The well-known ufologist Richard H. Hall then said he had newspapers clippings of the time on this matter; which were held by Major Donald Keyhoe, who had long been the Director of NICAP; Richard Hall also was a prominent member of NICAP. Richard's problem was that these clippings were in Portuguese, and no one had been able to translate it so far. He then asked if anyone was willing to translate them into English. I volunteered, and Richard Hall did not just send me these clippings, but a big packet of UFO documents of all kinds, all in languages other than English. Among these a few papers from Raymond Veillith, such as the one shown here. [rv1] "Déclaration de Mr Sauthon à Evaux les Bains (Creuse)", note by Raymond Veillith, my personal file. 0.1 Patrick Gross September 11, 2007 First published. 1.0 Patrick Gross December 26, 2008 Conversion from HTML to XHTML Strict. First formal version. 1.1 Patrick Gross February 28, 2010 Addition [ud1]. 1.2 Patrick Gross November 2, 2016 Addition [ub1]. This page was last updated on February 28, 2010.